Disney magic meets Mondo sorcery. The only question I have at this point is how did it take so long? 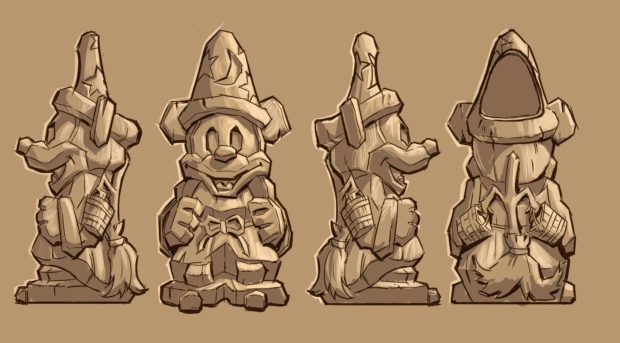 I can resist the pins (I think), but something about the Tikis (or as they call them, “Tee-kis”) has me already hypnotized and they’re still only at the concept art stage. At this right, I’ll never have a money bin of my own, but I can gaze at a finely glazed ceramic one, imagining it sounds like David Tennant. Mondo is thrilled to announce their official license from Disney, with plans to create new products across apparel, collectibles, games, and more. To kick things off, Mondo is excited to unveil their first collectible pins for Mickey Mouse as well as new tiki mugs featuring Sorcerer Mickey from Disney’s Fantasia and DuckTales’ Scrooge McDuck. “Imagination is often associated with Disney, and rightfully so. Through their films, animated classics, and characters, Disney’s pantheon has inspired generations, old and young, to dream big. For us here at Mondo, it’s no different. We’ve all had our imagination stirred by Disney in one form or another in the work we do- whether it’s to design better, dig deeper for inspiration, or just add more heart. With this in mind, we couldn’t be more proud of what we’re bringing to both Disney and Mondo fans alike. From our pins and tiki mugs, as well as other fun items down the line, we’re taking our queue from Walt himself- ‘If you can dream it, you can do it,” said Mondo Creative Director for Toys/Collectibles Brock Otterbacher. Mondo have re-envisioned an impressive lineup of the most recognizable Disney icons as tiki mugs, and they couldn’t be more ecstatic to take on some of the biggest yet, starting with Mickey Mouse. As seen in the 1940 classic Disney’s Fantasia, Sorcerer Mickey will be the first in their line of Mondo Tee-ki mugs based on various Disney animated and live action gems. Next will be Scrooge McDuck, who even in mug form is never far from his Money Bin, followed by mugs from Disney’s The Lion King, Tim Burton’s The Nightmare Before Christmas, and many, many more! Now’s your chance to drink up the magic of Disney!